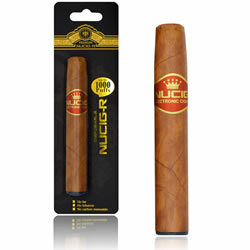 The 'Cubana' NUCIG-R is really amazing. Not only does it last for the equivalent of 100 cigarettes (1000 inhalations) but our unique 'Cuban' flavour tastes like a high quality 'Cuban' Cigar. I have been using them for 4 years now. Always good and delivered within 1-2 days normally. Saving a fortune compared to my old real cigars and I don't smell like an ash tray anymore ! Good product, looks great too. It really does look like the real thing. When you inhale, the tip glows like a real burning cigar and on the exhale you get lots of vapour which is very effective. Not as good as the classic e cigar, as it doesn't have a tapered end piece, and a bit too thick- gagging reflex when clamped between teeth, and a bit on the heavy side, for its size. very good product, wish it was a bit longer but all in all would recommend.